Is Matterport deeply discounting its Camera - first $600; now $900 (Promo Code 20/20)– to clear out inventory in advance of announcing a new Camera? Would be one of first in line! mmm, where there is smoke there is a fire? Every other company would probably release some news that they have a new camera in the works. But since MP is so backwards thinking it is hard to say. A person from MP once told me that there would be the option to send the MP camera in to MP and have it updated with the new components if there would be a new camera. Anybody got that information from MP? I think they are. This type of gradual price reduction is exactly what Canon does when getting ready to roll out a new model. I think they will roll something out with better sensor (sensors?) for better image quality, and probably a sleeker design. The image quality really is pathetic. I just had a conversation with the marketing director for a local Sotheby's franchise who asked me to reshoot 5 images form a recent photo shoot. The images were actually quite good, the windows were just very bright. They(Sothebys)are actually combing through agent's still photos, and culling the "imperfect" ones before allowing the properties to be placed in their highend marketing channels. I expect this trend to continue. Here's what Steve Jobs said in 2007 after he released a cheaper 'iPhone 2' two months after releasing iPhone 1 ..
"Our early customers trusted us, and we must live up to that trust with our actions in moments like these"
Many iPhone 1 purchasers were upset about the iPhone 2 surprise. To compensate, Steve gave iPhone 1 owners (including me) a $100 Apple Store gift certificate. Note that Mr Jobs discussed "trust" and the desire to maintain it. Also note that Apple didn't discount the iPhone 1 before releasing iPhone 2. Folks might have been even madder if that happened. I'll put in my guess of .. Matterport will announce a newer camera before it comes out, and if they do discount the current camera, they'll let everyone know a newer one is on the way. My iPhone 1 was great, but if I'd only waited a little longer, I could have gotten a better model for less money. Apple doesn't seem to surprise us anymore after that incident. They knew iPhone 2 was right around the corner when they sold iPhone 1. They just kept that important news a secret. I would welcome a better sensor for sure. Iv'e had several jobs that are borderline acceptable. I wouldn't be happy with them as a paying client but Ive been lucky that this particular client seems less picky than me. Im not happy putting my name to them which is why I don't in some cases. a new camera/upgrade would definitely be welcome here. I see we all talk about a new camera, competition and better service support. I like @UserName quote form Steve Jobs, a great example of a company committed to support. I am not as upset about them discounting for a new purchases, I just don’t understand the lack of communication. I think they are better at reaching out for input but I have not seen as much feedback. There was a thread talking about the sensor not being available. So are they discounting cameras to deplete their stock of these sensors before the release of a newer camera/sensor has been released and nobody wants this product with this sensor. We talk about competition, I see Planitar as that competition. I personally which I would have waited and bought it. Even though the camera base is Cannon, UGH . After watching several Utube videos, the option to view the photos immediately. I see this as tool that can’t be matched. We all talk about poor image quality that we find several hours later and not being able to get back to the job. The client being upset with photo quality. I myself contacting customer support only to be told the engineers know about the issue but this is the best we can do at this time. Being able to view and reshot if needed an invaluable tool. The one thing I have not seen is the quality of the stitching, but that is also a positive because I do not see any obvious issues. Knowing the Matterport issues I’ve tried to see similar issues and can’t find them. I personally wish I would have purchased this system and may switch. The down side is it is not automated on its rotation, but maybe another positive because you won’t get an unstable error message. I liked Matterport at the initial buy at the time, I see them slow to respond as time has gone by and slow to deliver on promises. Probably the sadist point is them not willing to or open to the third party ideas and developed products. Just my thoughts, and no I have no stock in Planitar just my observations. Oh and by the way would I jump on board for a new Matterport camera probably not unless, there was something so phenomenal about it that again initially it showed me something new and so far out of the box I would be crazy not to get it. But that would have to be something other than a few simple improvements, like just image quality improvement which again they could do now but don't. Maybe I would buy a new camera if they just put a new label on it Matterport II, and did nothing else. Yaaaaa sure I don't think so. A new camera could be in the works but it makes me think it could be their way on generating sales before the end of the year for the balance sheet. There have been several threads about different companies maybe purchasing Matterport. There was one on here about 5000 cameras being sold thus far but the growth is there. Maybe that piece was generated because they know companies might be watching and last year they sold x amount now this year it is higher than they could have imagined. Then they calculate the number of recurring revenue with the monthly subscriptions and say we are bring in x dollars after the initial sale. I would welcome either one. I think there is room for a higher quality scan, so a new camera would be good. A new owner could also be good and almost better for us. That is if they listened to what we wanted and were open to people developing tools for the greater good of the platform. I feel they could probably improve the software end. As long as they don't raise subscription costs, I'm happy. That's the one thing that made me nervous about buying a MP (just got mine a few months ago). Being at the mercy of their fees and programs felt a little rattling. Not that I don't love the camera, but if they start phasing it out or dropping support, that's going to be mildly irritating to say the least. There is always a chance of a new camera coming. After all technology advances on a daily basis so sooner or later the Matterport camera will be obsolete. But I don´t think this is the reason they are discounting the camera price. I agree with @justinv in the sense that they are trying to make "good numbers" for their balance sheet so they can impress their investors. Each camera out there in the market means the promise of a steady monthly cash flow, which is Matterport real business model: not selling cameras but generating processing and hosting income with their closed technology (something that they are having a hard time understanding it). So, answering Dan's question: No, I don´t think that a new camera is coming, and if it is, I don´t think it will be a disruptive model that will justify rushing towards Matterport's site to buy it. So far image quality is very good for me, and my customers are more than happy with the results. 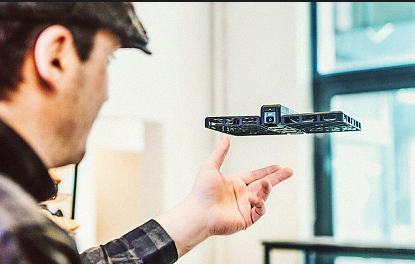 Maybe this type of Matterport camera wouldn't be impossible ..
You place it in mid-air where it rotates rapidly and scans the room. If you wear special clothing, the post-processing software can blend you out of the picture using some kind of content-aware filter. You then walk to another point where you'd like a scan and the hovering camera follows you. Or you could simply grab it and move it. This camera is the self-flying Hover camera released in October and it only takes 4K video and 13MP photos. They don't call it a drone or a quadcopter. To them it's a flying camera. You can also set it to do 360 spins, fly patterns and follow you. Since Matterport may not be able to miniaturize it's key hardware and sensor components to fit inside a tiny floating device, maybe the device could simply capture images and communicate with your laptop. The laptop handles all the processing. With the tripod gone, your entire scanning tool almost fits in your pocket. And, you can deploy it to any altitude or coordinate within a home rapidly. Since I don't know what's in a Matterport camera, maybe technology hasn't advanced enough to allow the miniaturization of lenses and sensors needed to create a floating scanning photo-grabbing camera that transmits its data to a remote laptop for processing. Long, long pondered by me, I'd have to say that I'm solidly with @justinv and @jfantin from a "good numbers" perspective. First with $600, now with $900, I'm now pondering how low they'll now go as the price is much higher in the UK than I'd like it to be at £4,100 including VAT and delivery! If that was true, Matterport would be reusing the rotator and the battery and probably the little Linux computer in there ... but the case itself would need to be replaced as it's proprietary to the shape of the existing cameras. I was hoping InsideMaps allowed you to use your own capture camera. If they did, I could buy a hover camera and use it to capture 360 views of rooms and upload it all to InsideMaps. But, they say it only works with an iPhone sitting on their special tripod. That doesn't mean we couldn't come up with our own processing service that converted images taken from a floating hover camera into 360 pano tours the same way InsideMaps converts iPhone images into pano tours.As an old Matterport thread about InsideMaps notes, InsideMaps is pretty impressive. Maybe if InsideMaps photographers took more scans, it would all flow more smoothly as you walked through a house. 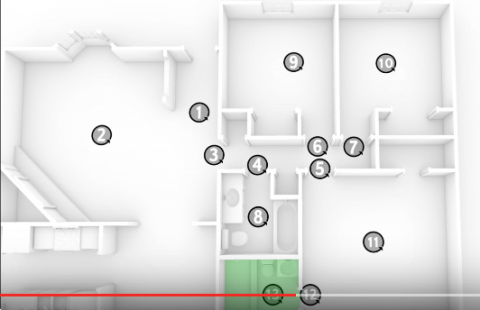 Inside maps seem to recommend one or two scan points per room.